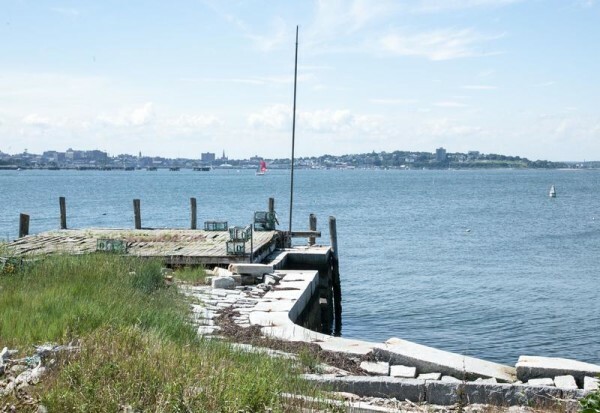 A view of Portland Harbor in 2013 from a granite wharf dating to the 1850s on House Island. The island, bought by developer Michael Scarks in May, was designated a local historic district. PORTLAND, Maine — House Island, the 26-acre Casco Bay site of military and immigration facilities, became the newest city historical district Monday by a unanimous City Council vote. Support for creating the island historic district came during more than 20 minutes of public comment. Island owners Michael Scarks and Vincent and Christina Mona did not attend. Scarks bought the island from former owner Harold Cushing in May 2014 and sold the northern half of the hourglass-shaped island to the Monas last September. The couple are principals in Three Palms Design, based in Naples, Florida, and have restored historic properties, including a home on Capitol Hill in Washington, D.C. The new owners opposed the designation as it was considered by the city’s historic preservation committee, saying their plans for renovation and possible new construction would maintain the historic integrity of the island. The city planning board also endorsed the designation, which allows oversight by the historic preservation committee and the planning board on site plans. The southern end of House Island is occupied by Fort Scammell, first used in the War of 1812 and considered a part of city’s defenses into the 20th century. Scarks said last fall he understood and appreciated the historic nature of the fort, which is not included in his development plans. The northern half of the island was part of a network of immigration stations used from the 1890s through the mid-1920s. Remaining buildings are about a century old. The military and social history of the island were highlighted by supporters of the historic designation, who warned a lack of protection could endanger its future. “A group of school children walking around the island could experience a history lesson of several hundred years,” Peaks Island resident Arthur Fink, a former member of the historic preservation committee, said.